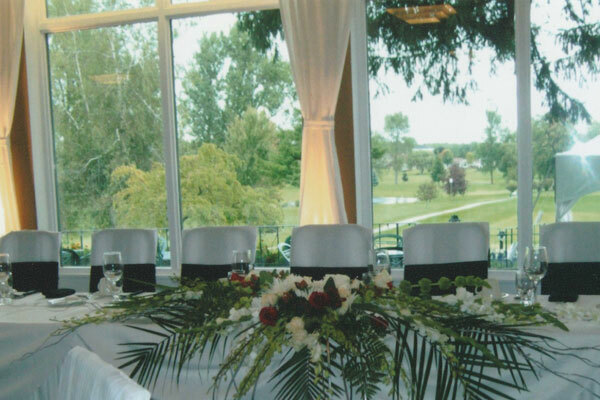 Our private location with the stunning views of the course and the St. Lawrence River is the perfect setting for your special day. Your wedding day is one of the most important days of your life; a day you dream of as being absolutely perfect. 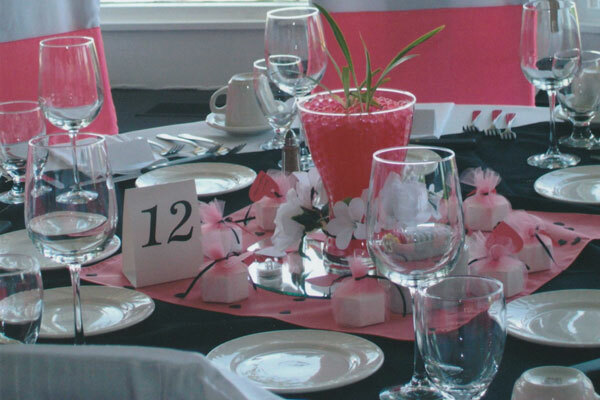 The Club offers various wedding packages and caters to any special needs. Imagine exchanging your vows on the terrace on a beautiful summer day surrounded by breathtaking views that simply enhance the memories of your very special day. If your choice is an indoor ceremony, you will also enjoy the spectacular views offered by the large surround windows throughout the entire reception and dining areas. 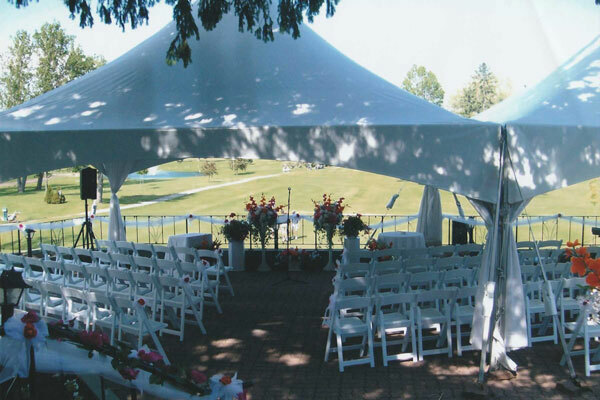 The outdoor private patio is available to you, whether you choose to have an indoor or an outdoor wedding. If you choose to have a traditional church wedding we will be happy to host your reception following the service. 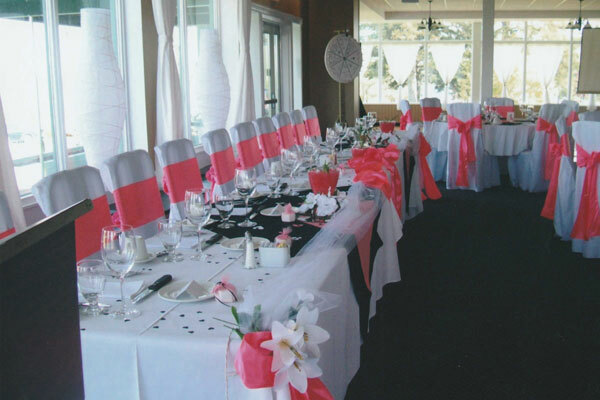 Our reception room will accommodate up to 180 for dinner. We can recommend wedding decorators to help with your dream designs, or you and your friends can create your own individual masterpiece. We also offer suggestions regarding photographers, wedding cake designers, wedding officiates, DJ’s or live music. Following the wedding ceremonies a 1000 square foot dance floor is available for those who enjoy showing off their best moves, or tripping the light fantastic! 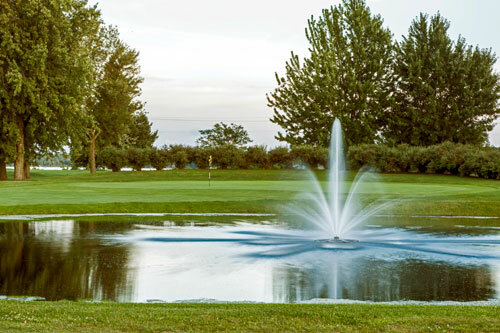 Enjoy our many stunning backgrounds for unique wedding photos including the water fountain feature on Hole 17. 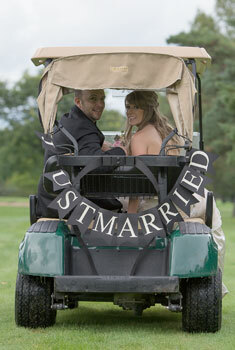 Golf carts are available to whisk you and your wedding party to the sites of your choice. Executive Chef Mike Anderson who boasts 43 years of culinary experience with 11 cooking diplomas, will prepare an unforgettable meal for you. Chef Mike’s Prime Rib is renowned as Cornwall’s very best. A variety of menus, at competitive prices, can be planned and customized to suit any special needs you or your guests may require. Our food and beverage team will make sure that your expectations are surpassed. For more information about hosting your reception and/or ceremony with us, please contact Chef Mike at 613-931-1122 ext 230 or bogeys@cornwallgolf.com. He will give you more details about all the extras that come with having your wedding here at the Cornwall Golf & Country Club. Mike, Words can never truly express our genuine gratitude for making our wedding day a most amazing one. It didn’t seem to matter what we asked you for, you were able to provide it. The food was superb, and the extra touch to provide a special meal for Brit was beyond expectations. You truly are a master of your craft. It was a pleasure dealing with you. You have a way of making everything seem easy. Thanks again, Mike, you have become a friend. Our day could not have been more perfect. Pam and Mike you were both so easy to approach and so helpful during our planning stages. The wait staff , bartenders and kitchen staff could not have done a better job. We are extremely grateful to all of you. Thank you!!!!! Capture the moment by taking magnificent photographs at various locations on the golf course. Golf carts made available to the wedding party allow you to reach the location that best suits your photographic needs. A bridal room with a magnificent view and plenty of mirrors is available for the bride and her attendants. The wedding party may be offered a round of golf (with carts) compliments of the Cornwall Golf & Country Club.